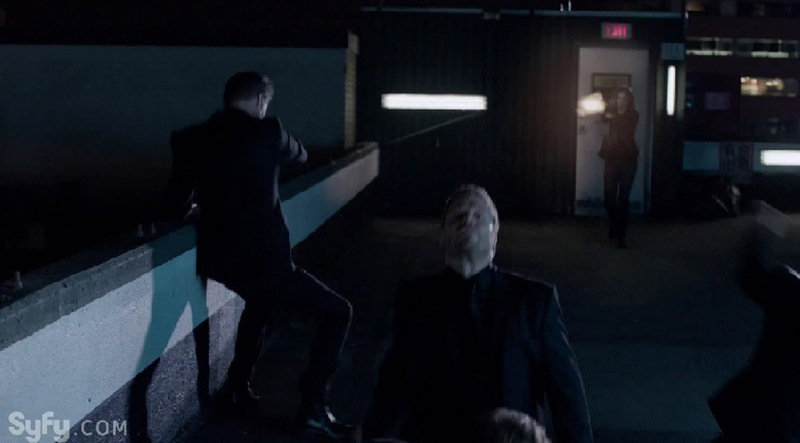 Dr. Cassandra Railly (“Cassie”) spent eight months in 2043/2044 before showing up in 2016 at the end of the previous episode to save James Cole’s life before pointing her gun at him (or at Jennifer Goines, who is standing behind Cole). Cole reciprocates by pointing his own gun at Cassie to keep her from killing Crazy-as-a-June-Bug Jennifer. Cole: How long were you there? Thankfully, those eight months have been filled in for us a bit more, as this episode opens with a one-minute-and-eighteen-seconds montage of Cassie killing people and stealing electronic parts (so Katarina Jones can rebuild her time machine) accompanied by a voice-over narration in which Cassie talks about how much she changed due to what she did during those eight months. Obviously, an expository montage of 78 seconds can’t effectively demonstrate how much Cassie changed. However, we are given enough information to allow us to subconsciously fill in the blanks—because that’s how the human mind works. As part of the cognitive process, we instinctively try to understand images as moments in a longer sequence of events. Thus, each viewer will subconsciously fill in Cassie’s missing eight months with his or her own conceptions of the “horrible things you never thought you’d be capable of” that Cassie refers to in her narrative. However, aside from shooting a man, what horrible things did she do? Everyone knows what she did because everyone’s subconscious knows what she did. 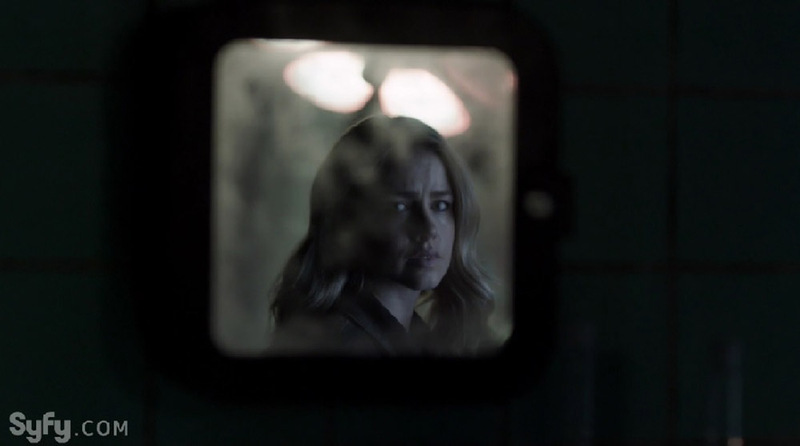 Whatever horrible things Cassie did will be different for different viewers, but we are all given the visual symbolism of her having been boxed in by those horrible things. The above image shows her likeness in a small, square mirror with a distorted reflection—symbolizing her limited choices that have distorted her sense of self. She did what she had to do to survive in the post-apocalyptic world of 2043. Thus, not giving viewers more information than we were given in those 78 seconds is more effective than if we were shown an entire episode of the series that was devoted to Cassie’s eight-month ordeal. We get the symbolism of her image in the mirror and our own subconscious sense of the horrors she experienced. 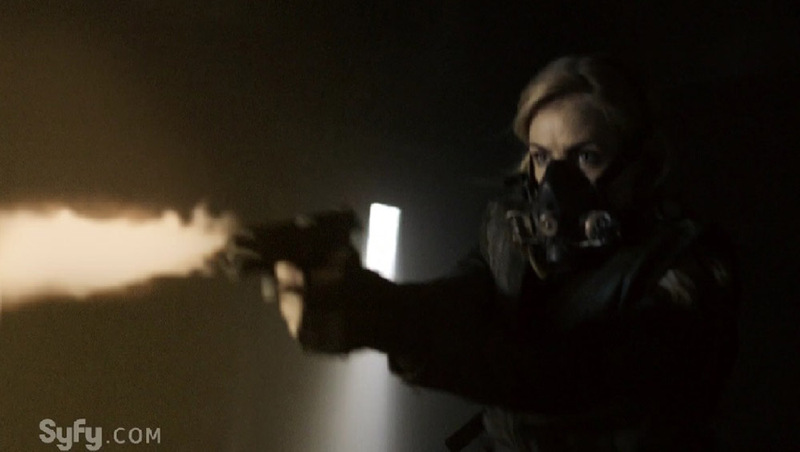 Still, I wish we had been given a glimpse of something a bit more “horrible” than Cassie killing a man in self-defense (even though his “attack” was due to him defending the facility Cassie was there to rob). A brief image of her torturing someone or prostituting herself for either information or security would have made more of an impact on my subconscious. Regardless, whatever horrible things Cassie did in undergoing what she describes as her “metamorphosis” forced her “to accept that not every caterpillar becomes a butterfly.” Her changes made her “hideous” like a moth rather than “beautiful” like a butterfly. Based on this episode, I doubt I’m going to like the new Cassie. She is harder and colder. She kills without remorse, is willing to leave Cole in 2016 because he has become too sentimental, and she implies that she will harm Ramse’s son if Ramse won’t give them the information they want about “The Twelve”—information that Ramse honestly does not have. Cole: Look, I know your being this way is my fault, but this isn’t who you are. Cassie: What I am is because of me; nobody else. Everyone and everything changes, Cole. Cassie’s point is valid, of course, and it ties into one of the main motifs of this series—the issue of Destiny vs. Free Will. 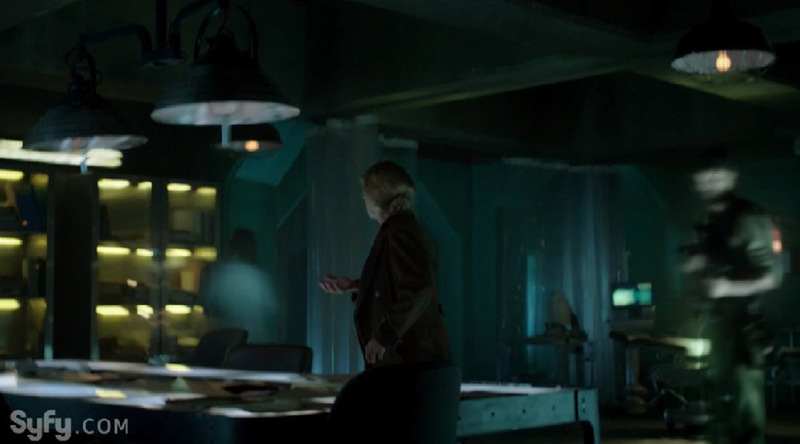 In many ways, the events in the series seem to indicate a sense of destiny—or, as another TV series about time travel often presents the concept, “time is intent on happening” (or however Rip Hunter expresses it on DC’s Legends of Tomorrow). Originally, the global pandemic that led to Cole’s post-apocalyptic timeline began in 2017. However, after Cole stopped the pandemic from occurring (halfway through the first season), the date of the beginning of the pandemic shifted to February 8, 2016. 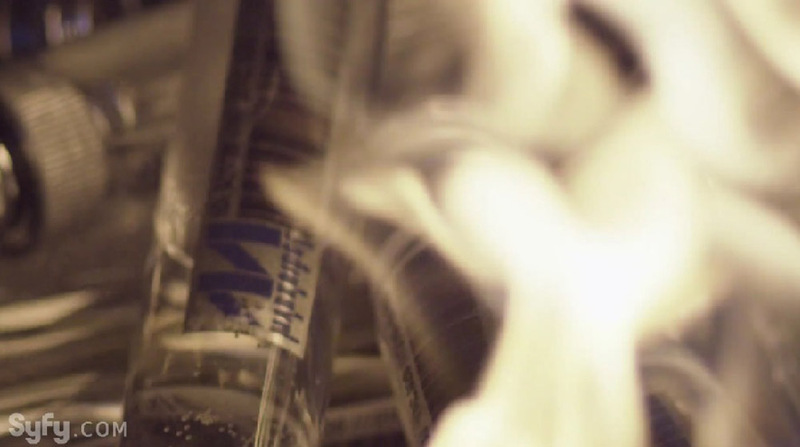 In this episode, Cole and Cassie prevent the outbreak by burning Jennifer’s vials that contain the virus. However, now the start-date for the global pandemic has shifted to 2018. It seems as if the pandemic is destined to occur—that time is intent on happening. Yet, the 2018 pandemic is not as bad as the pandemics that were supposed to begin in 2017 and 2016. Thus, some aspect of free will is in play as the choices people make can at least slightly alter destiny. However, it might not actually be “time” that is intent on the pandemic happening. The enigmatic “Twelve” who sent agents into the past may be manipulating events to ensure the pandemic occurs despite the efforts of Cole and Cassie. The temporal destinations of these agents of The Twelve are not known—but Cassie believed Ramse knew their destinations because she was still operating under the assumption that he was the mastermind. However, Ramse was merely an expendable pawn of the actual mastermind. Cole has been pushing his view of a universe that operates on the foundation of free will—which naturally connects to Katarina Jones’s cause-and-effect universe. However, The Twelve have openly scoffed at Katarina’s notion of causation—claiming that she does not understand the nature of time at all. The ambiguity of the issue of Destiny vs. Free Will (or Acausality vs. Causation) continues with confusion, as Cole who believes in Free Will discovers one of the temporal destinations of the agents of the Twelve when he finds a photograph of Cassie and him that was taken on September 1, 1944. He found it in a hotel suite that he purchased in 1944—a hotel that Jennifer led him to through her focus on the prime number 607. 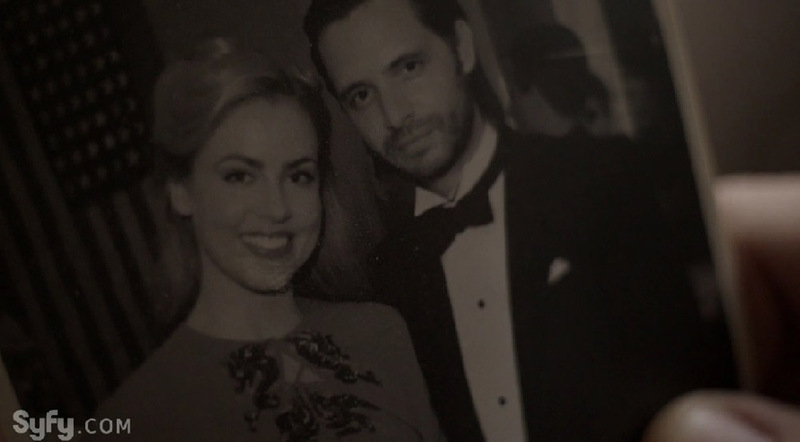 Yet, if Cole had not found the old photograph of him and Cassie that was taken in 1944, then he would never have traveled to 1944 and the photograph would never have been taken. It’s a paradoxical time loop that supports a cause-and-effect conception of a universe that is founded on predestination. Perhaps the series will eventually get around to what must actually be occurring—freewill actions don’t alter the course of time; they create parallel universes. Instead of time shifting around the people who have been injected with Katarina’s time-travel serum, they are actually passing from one universe into a parallel universe. At least that’s my theory . . . for now.